Charles Yu, How to Live Safely in a Science Fictional Universe. Corvus Books, 2010. Pp. 256. ISBN 9781848876828. £7.99. This book contains itself. Which is to say, this book exists inside this book, just as Charles Yu exists inside this book. The inescapable corollary of this is that this book exists outside this book, or—to put it another way—this book exists without this book. The book is read; the book is written; the book is reconstructed, repaired, rewritten. These actions are all simultaneous and equivalent, and Yu is clearly saying that this book is our book, that if we aren’t going to put the work in then he can’t do it for us. He’s right; this is an intensely complex and dense book, and one that powerfully rewards a reader who’ll work at their reading. The spine of the novel is structured in a relatively classical way for an SF story, telling the story of a single time loop and its resolution. On the other hand, not only is “relatively” the keyword for two very good reasons, but this is as much meta-SF as it is SF. The universe within which the book’s set is quite literally science-fictional, operating by explicitly science-fictional physics (operated by Time Warner Time™), and undramatically aware of its own ontological status. As we can expect from a non-white author, it is very aware of status and hierarchy issues within the universe-that-is-SF, and “the way the world works”, socio-politically, is literalized in the story of Yu (senior)’s attempt to invent a time machine in his garage and the establishment figures for whom his demonstration doesn’t work. As with any good science-fictional inventor, Yu doesn’t let that put him off, and he effectively goes on to invent newer, more rarified branches of fictional science. Since this is a family novel, however, he never will have gone on to become the man who invented the time machine, and all the time spent inventing inevitably becomes snarled up with love and belonging and selfhood in Charles Yu’s mind. As I mentioned above, “relatively” is the keyword for this book. First, time travel operates via a mechanism of perspective, shifting tenses and thus one’s perception of time, and there are no absolutes. Secondly, it’s a very traditional Family Novel, interested in father-son and mother-son relationships; the narrator is obsessed with finding his lost father, in the kind of looping circling way that normally requires therapy to untangle. His childhood trajectory was a fairly standard masculine one: from mother-space, home and abstract learning (tenses, particularly) into the father-space of the inventor’s garage, and thence into the wider science-fictional world. One way to look at this book is as Yu’s reified psychological journey out of father-space (tellingly, it’s described—as is nearly everything else in the book—as a box) into full independent selfhood, and coming to terms with his adult relationship with his mother. I am of course speaking of the fictional Yu; I wouldn’t want to venture an opinion on how closely that Yu maps to the Yu who wrote this book, nor to be honest do I care. Yu tells us up front that he is not a protagonist, since that’s a restricted occupation within the science-fictional universe; instead, someone has to be the guy who fixes stuff, and what Charles Yu fixes is time machines. With nothing but his work, he lives inside his own time machine, with the AI who controls it and his nonexistent dog (a member of a set of ontologically valid entities which nevertheless do not actually exist; likewise, The Woman You Never Married and The Woman Your Mother Might Have Been, both of whom play roles in the novel) and the main strand of the novel is what happens when he crosses his own time stream and gets trapped in a loop. As in all SF, this is something you should never do; it always causes problems. Then again, that’s what time machines do, here; they cause problems. The first thing everyone wants to do is to set right what once went wrong, and they can’t. So: a time machine is a device for reliving the worst parts of your life. On the other hand, as Yu demonstrates for us, that isn’t always a bad idea. 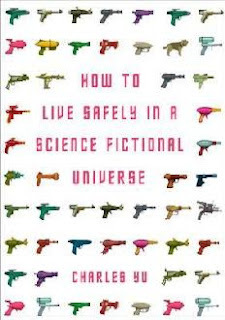 Especially for a first novel, How to Live Safely in a Science-Fictional Universe is extremely well-written, and I enjoyed it immensely. The acclaim it received last year is well-deserved, and I think that whilst it approaches its aims very obliquely, they are very thoroughly met.